After a lifetime in the intelligence community, where he rarely spoke publicly and was required to maintain a nonpartisan stance, Brennan is cutting loose now that he's a private citizen. In the interview, he was particularly critical of the president's moves to back away from existing agreements, like the Iran nuclear deal or the Paris climate accord, that were worked out under President Barack Obama. "He continues to denounce the things that happened before him. Everything seemed to be broken and wrong and misguided before Mr. Trump took the Oval Office," Brennan said. If Trump "wants to go in new policy directions, fine, and he can do that. But he shouldn't be throwing out the baby with the bathwater just because it was something that was formulated under his predecessor." Last October, Brennan put the chances of armed conflict between the U.S. and North Korea at around 25 percent. Today, he's cautiously optimistic that talks between North Korea, South Korea and the U.S. can reduce tensions — but is deeply skeptical there will be a quick breakthrough on reducing or eliminating the North's nuclear weapons program. "I think things are in a better track. But I am still rather realistic about what the prospects for denuclearization are," Brennan said. "Maybe over time, there will be a reduction in the nuclear stockpile in Pyongyang, there will be a reduction in ballistic missile capability, and maybe ultimately one day we will see a denuclearized Korean Peninsula." On Iran, Brennan said he's not opposed to the Trump administration trying to get a supplemental deal that would include additional concessions from Iran — but he also believes the current agreement is worth preserving. Tearing up the deal, he says, "would send an awful signal to the Iranian people that you can't trust the Americans' word. It would send an awful signal also, I think, to North Korea about what if they're even contemplating some type of understanding, agreement with the United States." I'm glad that the rhetorical broadsides that were going back and forth between Pyongyang and Washington have calmed down. I am pleased that there are some direct discussions taking place now between the United States and North Korea — I think that's good. But whether or not Kim Jong Un will agree to dismantle his nuclear weapons capability is a very different question. Yes, but it was a commitment by a U.S. administration, along with many other signatories to it, and so that — although it's not a signed treaty, you know there are a lot of things that the United States has committed to internationally that don't have a signed treaty that undergird them. So I do think that the U.S. word, it really needs to be maintained. Take politics out of this. And that's what Mr. Trump is doing — he continues to denounce the things that happened before him. Everything seemed to be broken and wrong and misguided before Mr. Trump took the Oval Office. That's absolutely B.S. I'm not going to get into what I may have known or not known while I was the CIA director. I just am looking at his performance since he has become president of the United States, and the — in some respects — fawning attitude toward Vladimir Putin, while he speaks with such denigration about his fellow Americans. It's hard to understand. And so, is he afraid that Mr. Putin might have something on him? Maybe, I don't know. But only Mr. Trump knows what he might be vulnerable to. I don't know. On intelligence collection and questions over whether the CIA "steals secrets"
I have been rather frustrated over the years by people claiming that the intelligence community — CIA, NSA and other things — break the law. ... [E]verything that CIA and NSA does is consistent with the law. And so when we go out and collect intelligence overseas, it may be breaking the laws of other countries because we're engaged in espionage, but it's wholly consistent with U.S. law. ... Yes, they do [steal secrets], in other countries. But stealing is not what we do here in the United States. Alyssa Edes and Renita Jablonski produced and edited the audio story. 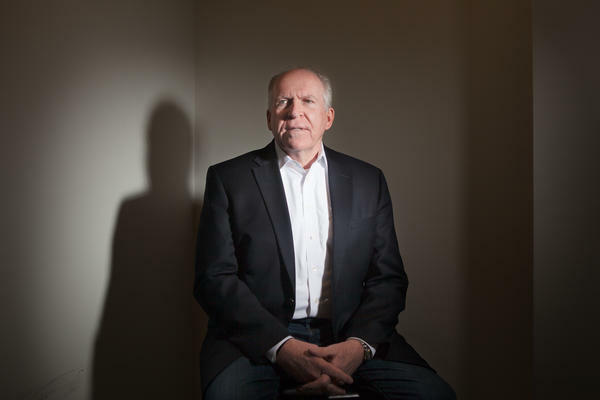 These days, John Brennan is a private citizen free to speak his mind as long as he doesn't venture into any classified intelligence. Brennan ran the CIA until the stroke of noon on the day Donald Trump was sworn into office. Since then, Brennan has made a point of attacking the president, and that's one of several things our colleague Mary Louise Kelly asked about when she sat down with Brennan here in our studios this morning. They also talked about Iran and Russia. And as historic talks begin between North and South Korea, they discuss the prospects for war or peace on the Peninsula. MARY LOUISE KELLY, BYLINE: John Brennan, welcome. JOHN BRENNAN: Thank you so much, Mary Louise. KELLY: Thank you for coming in. Let me start with North Korea. Last October, you put the chances of armed conflict with North Korea at 25 percent. And I'm curious where you would put them today. BRENNAN: Well, I was asked whether I thought war was likely or a conflict likely, and I said, well, it may be as high as 20 or 30 percent. And I think that is too high given the potential for an escalatory cycle that could lead to the death of hundreds of thousands of people. I am glad that the rhetorical broadsides that were going back and forth between Pyongyang and Washington have calmed down. I am pleased that there are some direct discussions taking place now between the United States and North Korea. I think that's good. But whether or not Kim Jong Un will agree to dismantle his nuclear weapons capability is a very different question. KELLY: A big, open question. KELLY: So it sounds as though you're relieved things are a little bit calmer. BRENNAN: I would lower those risk right now. KELLY: You would lower those numbers a little bit. KELLY: Does that mean that the Trump approach is bearing some fruit? KELLY: The name calling - is that what you're objecting to? BRENNAN: The name calling, yes. I think it's certainly beneath the dignity of a president of the United States. But I think having a hard position and a rather resolute position against North Korea is an appropriate one. KELLY: As you well know, North Korea has a documented history of cheating on disarmament deals, of concealing illicit weapons programs. If the U.S. and North Korea can agree to some sort of deal, are you confident that U.S. intelligence would know if North Korea cheated on it? BRENNAN: Well, I don't think anybody can say that they have total confidence that we would know everything that's going on in North Korea. But if I use the example of Iran - when I look at the recent Iranian nuclear agreement, I have great confidence that if they were to restart a nuclear weapons program, that we the United States would know about it because of the regime that's been put in place. But as you correctly said, they have cheated in the past. They have violated agreements in the past. That's why I think we have to have a very strong verification program in place that would give us the confidence that they're not pursuing these nuclear activities. KELLY: Iran and the future of the nuclear deal there - you have in past said that tearing it up would be - I'll use your words - the height of folly. The latest tack by the Trump administration appears to be maybe not to tear it up. Maybe the U.S. can stay in the Iran deal if some kind of supplemental agreement is negotiated. Does that reassure you in any way? BRENNAN: (Laughter) Well, Mr. Trump, when he talks about the Iran nuclear deal - first of all, he speaks in hyperbole. You know, we got nothing for it. It was the worst deal ever. And that is not the case. We got a lot for it. There are issues related to its belying activities - its ballistic missile program. And those things I think can be addressed and discussed. But that doesn't mean it should come at the expense of tearing up that agreement because that would send an awful signal to the Iranian people that you can't trust the Americans' word. It would send an awful signal also I think to North Korea. KELLY: What is wrong, though, with the Trump administration trying to fashion some sort of supplemental agreement that would make it more favorable to U.S. terms? BRENNAN: Well, that's fine. But that's not what they were saying. That's not what Mr. Trump has been saying. KELLY: It's what they're saying now. BRENNAN: Well, now that's what they're doing, right. But to say that, you know, we're going to tear up that deal 'cause it was the worst ever - that's wrong. What they should do is build upon that. Build out from it. KELLY: We on NPR this week interviewed a senior State Department official. This is Brian Hook. He's one of the people who's talking to the Europeans - European allies about how this might play out. And he said, look; the nuclear deal was never a binding treaty. There are no signatures on it. It was a political commitment by an administration that no longer holds political power. BRENNAN: (Laughter) Yes, but it was a commitment by a U.S. administration along with many other signatories to it. And so that, although it's not a signed treaty - you know, there are a lot of things that the United States has committed to internationally that don't have a signed treaty that undergird them. So I do think that the U.S. word - it really needs to be maintained. You know, take politics out of this. And that's what Mr. Trump is doing. He continues to denounce the things that, you know, happened before him. Everything seemed to be broken and wrong and misguided before Mr. Trump took the Oval Office. That's absolutely BS. KELLY: Let me turn you now to Russia and to a comment, Director Brennan, that you made on TV about President Trump's relationship with Russia and Vladimir Putin. This was you speaking in March on MSNBC. BRENNAN: I think he's afraid of the president of Russia. BRENNAN: Well, I think one can speculate as to why - that the Russians may have something on him personally, that they could always roll out and make his life more difficult. KELLY: John Brennan, do the Russians have something on Trump? KELLY: What did you base that on then? KELLY: But you have no direct information that suggests that they do. BRENNAN: I'm not going to get into what I may have known or not known while I was the CIA director. I just am looking at his performance since he has become president of the United States. And the, in some respects, fawning attitude toward Vladimir Putin while he speaks with such denigration about his fellow Americans, I just - it's hard to understand. And so is he afraid that Mr. Putin might have something on him - maybe. I don't know. But only Mr. Trump knows what he might be vulnerable to. I don't know. KELLY: But is it responsible given your past position - your very recently past position as director of the Central Intelligence Agency to speculate and then not put forward evidence to support that in any way? BRENNAN: Well, that's exactly what speculation is. It's because you don't have information. And I said, one can speculate. KELLY: But people hear it coming from you and assume you know things that maybe I or an ordinary civilian wouldn't. BRENNAN: Well, I'm an ordinary civilian now. I'm a private citizen, and I'm speaking out. I speak out forcefully. KELLY: But you had access to the intelligence right up through the beginning of last year, January, 2017. KELLY: You saw the salacious dossier, the Steele dossier, that laid out all kinds of claims about President Trump and inappropriate behavior and Russia. BRENNAN: Yes, I saw that. But I certainly was not a person who either gathered that information or did any, you know, review of the validity of that information. But again, when I'm asked questions as to why - and trying to explain why Mr. Trump deals with Mr. Putin the way he does, you know, I will speak my mind. And I made it very clear. And, you know, perhaps, you know, as one can speculate, I don't know. SHAPIRO: That's former CIA Director John Brennan speaking there with our co-host Mary Louise Kelly. More of their interview tomorrow when Mary Louise asks Brennan what he hopes to achieve by taking on the president. BRENNAN: I'm speaking my mind, and I'm giving my views and my editorial opinion just the way the editorial writers in all the major papers and the commentaries that are on your program. Are we all doing Mr. Trump's bidding? No, I think we are speaking out honestly.